Cut a piece of pipe cleaner 2 1/4" long. Center it on the top of the tea light and glue only the ends to the sides of the tealight. You want to be able to thread an ornament hanger or piece of cord under the top of the earmuff! Next, glue a pom- pom right below the ends of the pipe cleaners. Make sure the glue is right next to that pipe cleaner so that the pom- pom covers it. Take a small 2-inch piece of ribbon, I love wired ribbon and narrower is better. Tie it in a knot and glue at the knot to the base of the tealight. YOU ARE DONE. 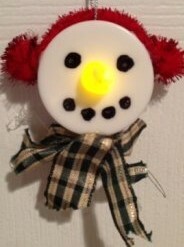 just push the switch on the back of the tea light and your snowman's nose lights up! Just way too cute!